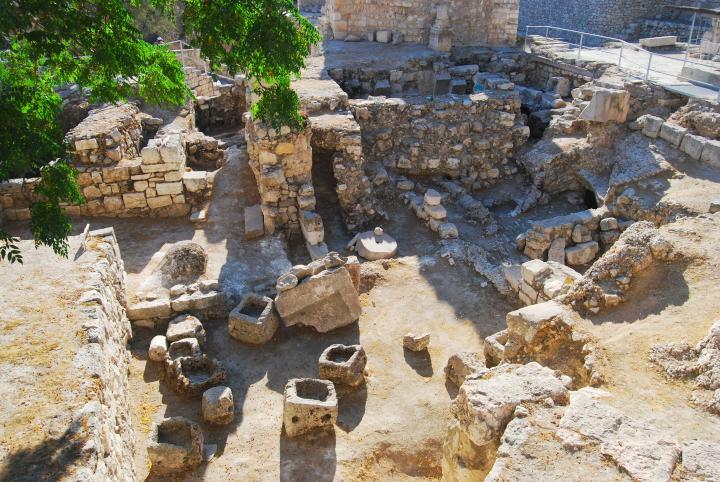 This photo is a view of the pools and cisterns in the excavations near St. Anna. This is the traditional location for the pools of Bethesda. This site is located in the Old City near the Lion's gate, north of the Temple Mount. These pools supplied water to the temple during the times of the first and second temple (until Herod). There are references in the Old Testament to the "Upper Pool", which may have been the name of the northern pool. Adjacent to the pools were baths and a healing center. These baths are the site of the healing miracle of Jesus in the pools of the sheep market, which was also called "Bethesda". Later, a Byzantine basilica was built over parts of the pools. The Crusaders built a small chapel over its ruins, and later a larger Basilica nearby (St. Anna) was built by the Crusaders, dedicated to the birthplace of Mary. Click here to read more about Bethesda pools. Jn 5:2-16: "Now there is at Jerusalem by the sheep market a pool, which is called in the Hebrew tongue Bethesda, having five porches. In these lay a great multitude of impotent folk, of blind, halt, withered, waiting for the moving of the water. For an angel went down at a certain season into the pool, and troubled the water: whosoever then first after the troubling of the water stepped in was made whole of whatsoever disease he had. And a certain man was there, which had an infirmity thirty and eight years. When Jesus saw him lie, and knew that he had been now a long time in that case, he saith unto him, Wilt thou be made whole? The impotent man answered him, Sir, I have no man, when the water is troubled, to put me into the pool: but while I am coming, another steppeth down before me. Jesus saith unto him, Rise, take up thy bed, and walk. And immediately the man was made whole, and took up his bed, and walked: and on the same day was the sabbath. The Jews therefore said unto him that was cured, It is the sabbath day: it is not lawful for thee to carry thy bed. He answered them, He that made me whole, the same said unto me, Take up thy bed, and walk. Then asked they him, What man is that which said unto thee, Take up thy bed, and walk? And he that was healed wist not who it was: for Jesus had conveyed himself away, a multitude being in that place. Afterward Jesus findeth him in the temple, and said unto him, Behold, thou art made whole: sin no more, lest a worse thing come unto thee. The man departed, and told the Jews that it was Jesus, which had made him whole.